There are a million recipes out there for chicken lettuce wraps. They all use the typical ingredients, some are peanutty, some are super spicey, some have minced mushrooms, some leave out the water chestnuts (which in my opinion are absolutely necessary), and most use ground meat (typically chicken, turkey or pork). This is my favorite recipe for lettuce wraps, and there are certain things I like that I include, but may not matter to others. 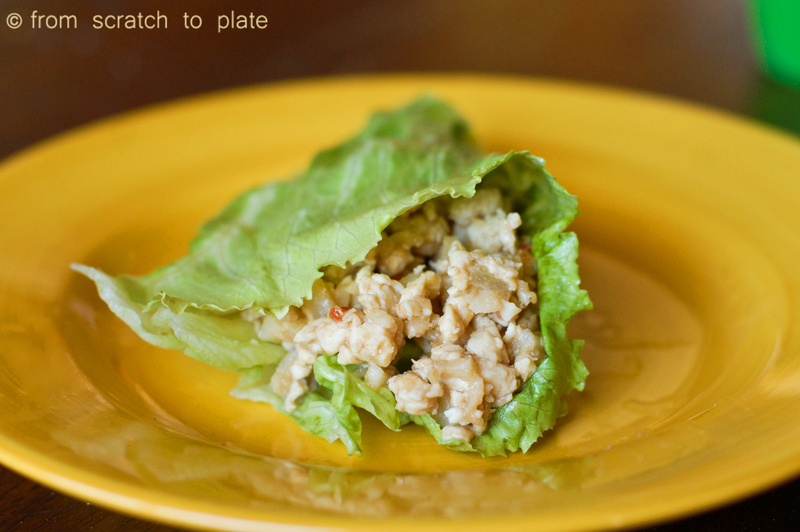 First, I don’t like the texture of ground chicken for my lettuce wraps. I like actual pieces of chicken, but ones that are chopped finely. To accomplish this, I use my food processor and chop the chicken, but don’t turn it into ground mush. 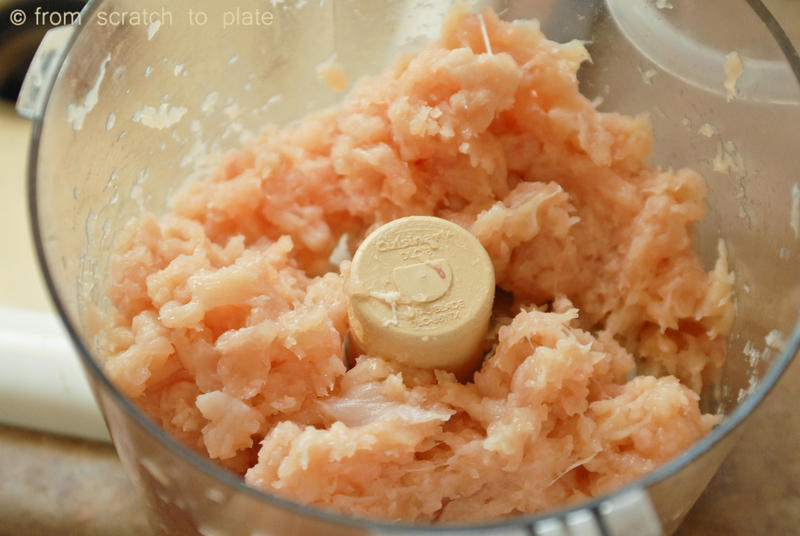 If you don’t have a food processor, you can do it by hand, or use one of those food choppers. Yes, it’s time consuming. 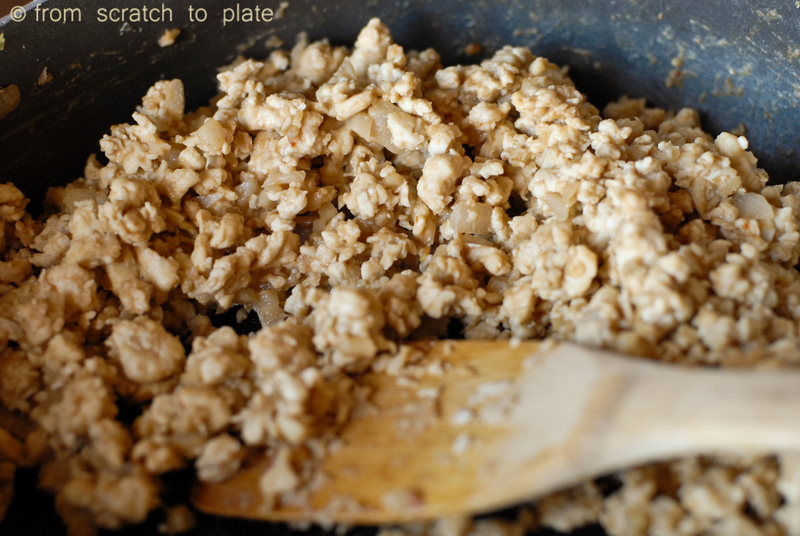 If you don’t mind the texture of ground meat, just use ground chicken, but the eating experience will be different. Second, water chestnuts. This is a texture thing as well. I think it’s important to have the hard crunch of water chestnuts to offset the soft chicken. Third, the sauce. I like a kick, but if it has too much of a kick, the kids won’t eat it. This recipe has the perfect mild kick for my family (the last time I made this my six year old ate FIVE lettuce wraps). If you like more of a kick, up the amount of chili sauce. I also enjoy the peanut butter base. You could use a different nut butter if you’re allergic to peanuts. I also leave out the soy sauce, as we have soy allergies in our house. Trust me, you won’t miss it in this recipe. If your family loves these, or you have a larger family, double it. You will thank me. This really only realistically serves four. Plus, the leftovers are awesome. 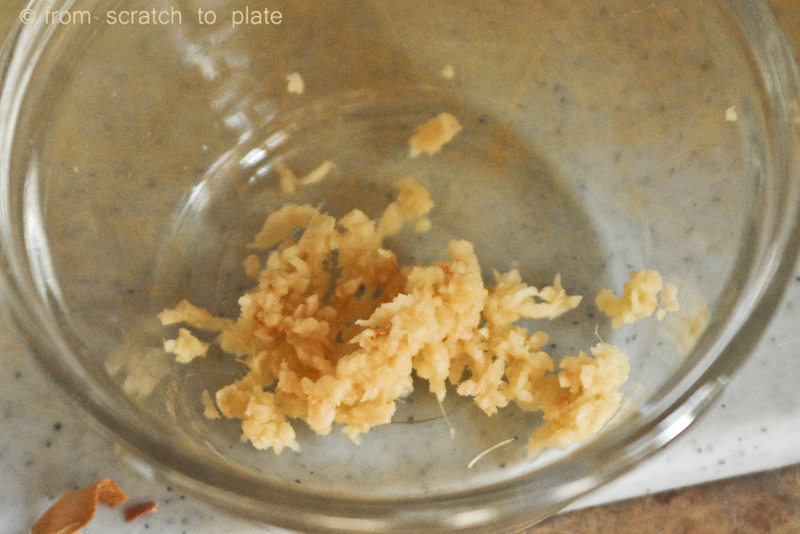 A few technical notes: fresh ginger will make all the difference in this recipe. To prepare it, I peel one side of the ginger, then use a box grater, using the one that looks like a shredding blade, but is smaller. (Does that make any sense?) Basically, my grater has a slicer side, a shredder side: the side you would use for cheese, then a side that is really small, like a zester side, and the 4th side looks to me like the shredder, but is smaller. I have seen this called the grater side (but I always think of cheese when I hear “grate” because we always got out the grater to “grate some cheese”, we never “shredded cheese”). That is the side I use. 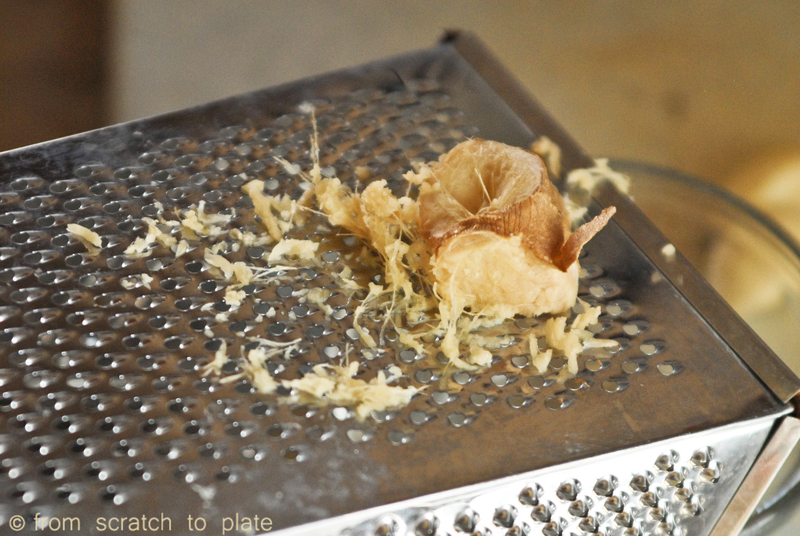 I grate the ginger, using the unpeeled side to protect my fingers. Then I scrape the inside of the grater to get all of the ginger and any juice. This takes some time, so I do it before cooking the chicken. The chicken cooks super fast. See the pictures if I have completely confused you. In a microwave-safe bowl, heat peanut butter and honey for a few seconds, just until warm. Add the beef stock, sesame oil, vinegar, chili garlic sauce and salt. Whisk together until well mixed. Set aside. Prep your veggies: Grate your ginger (see notes above the recipe for helps if you’re not sure how to do this) and mince your garlic. Set aside. Finely chop your water chestnuts and set aside. Finely chop your onions and set aside. Finely chop your chicken into small pieces, either by hand, using a food chopper, or using a food processor (use the ‘pulse’ button so you don’t completely pulverize it). In a large skillet, heat the olive oil over medium heat. Add the onion. Cook until onion starts to soften and add the garlic and ginger. Cook for one minute and add the chicken. Cook, stirring often until chicken is no longer pink (this happens very quickly). Add the water chestnuts and sauce. Stir continually and cook until everything is well mixed and sauce is hot. Serve with lettuce leaves. To eat, place a few spoonfuls in the center of a lettuce leave and wrap. Leaves closer to the center of the head of lettuce are naturally cupped and easier to use. ALLERGEN alert: To make this peanut-free, sub almond butter or hazelnut butter for the peanut butter. For gluten-free, make sure the beef stock, chili garlic sauce and vinegar are gluten-free. REAL FOOD alert: it is difficult to find chili garlic sauce without preservatives. If you need to, you can add an additional clove of garlic and red pepper flakes instead of the chili garlic sauce. Check your beef stock for additives and msg. Do you think it would be possible to use leftover chicken meat (like from a roast chicken) to make this? I’m always looking for ways to use leftover chicken meat. Sure! Just cook the onions, garlic and ginger, throw in the cooked chicken (diced up small), the water chestnuts and sauce. That’s a super quick meal!! Love what you see? Enter your email to follow this blog and get fresh new recipes by email.